What does the Blue Flame represent on my Tribe's Pins? Did you ever wonder what the number with the Blue Flame means? Read about it here. Chances are that when you've looked at the Pins in your Tribes you've noticed a Blue Flame in the top right corner of the posts. What does the number mean, and how is it calculated? It's very simple. The Blue Flame count tells you the total number of times the source URL for a Pin appears on Pinterest, Facebook and Google Plus combined. 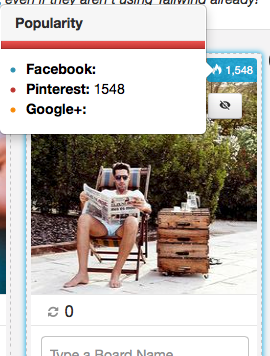 If you hover your cursor over it, you will be shown the breakdown for each social network. This generally matches the share counter on a blog post, for example. Paying attention to the Blue Flame is a good way of judging the popularity of a Pin, and can give you an approximate idea of the number of aggregate Repins a source URL has on Pinterest.